Maybe stealing glasses is a sport, I've got many of them myself from beer halls and beer gardens all over Munich. But this guy was done for "violent theft". This wasn't just a case of someone being nabbed with a glass in his jacket. It obviously kicked off so it sounds like he deserved what he got. yeah, heard about this on the radio last week. unfortunately the kid got caught and started a scuffle with the security guard, which led to assault charges. 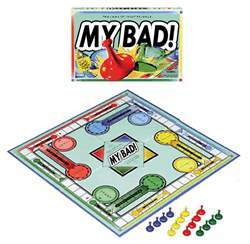 What does "my bad" actually mean? I know how and where it's used, but not why. It appears to treat the word "bad" as a noun, with the same meaning as mistake or error, in a slangy way. In the way that "attempt" is a verb, but can also be used as a noun. I am unsure of the etymology, I think it was introduced in a popular movie within the last decade or so. It makes sense really. Bad, Worse, Worst are all adjectives, but we can at least use "Worst" can be used as a noun too, as in "Do your worst". There are other ways of using "bad" as a noun too, such as "We have to accept the good with the bad". "I did something, and I recognize that I did something bad, but there is nothing that can be done for it now, and there is technically no reason to apologize for that error, so let's just assume that I won't do it again, get over it, and move on with our lives." from urbandictionary.com and is gangsta slang as well as being an update of the phrase, I'm Sorry... And now a Board Game!!! Something very annoying commonly said after one makes a mistake. I agree with the 'annoying' bit. Grates me everytime I hear this expression. Sorry! Misunderstanding of MY BAG, which is commonly proclaimed in the getto card game SPADES when a hand is over bid. So not only is it annoying but it's also just plain wrong. Not that the Urban dictionary was ever the gospel about what's right and wrong. Or indeed, not that there ever is an absolute right and wrong when it comes to language.